Do you set the same New Year’s resolutions every year? Do you recommit to the same goal, promising yourself that you’ll finally finish it? If you answered yes, know that you’re not alone. Many people are stuck in the same cycle of setting New Year’s resolutions, forgetting about them or failing to complete them, and then setting the same goals again with a renewed (but temporary) resolve to meet those goals. Goals provide you with focus. The decisions you make and actions you take should bring you closer to achieving those goals. Setting goals keeps you moving, increases your happiness, and significantly benefits your organization. When you set goals, you create a vision of what your life or your business could look like. Then you start pushing yourself and your team to get the best results possible. If goals are so important, why do we fail to achieve them? Because we don’t plan the steps to get there. A goal setting process forces you to think about the journey (in other words, how you’re going to complete your tasks) instead of just the end destination. Take a look at the steps below to get started. Before you set a goal, take a closer look at what you’re trying to achieve. Is that goal something you truly want? Is it important enough to you to pour hours of time and effort into it? If you’re not willing to put in the time, it may not be worth pursuing. Remember the proverb “A man who chases two rabbits catches neither”? If you create a long list of goals to pursue all at the same time, you may have a difficult time achieving any of them. Instead, use the questions above to determine which goals matter the most to you right now, and then focus on those few. Most importantly, make your goal specific so you can clearly track your progress and know whether you met the goal. The more specific you can be with your goal, the higher the chance you’ll complete it. For example, many people set goals to lose weight, but they don’t always decide how much weight they want to lose and when they want to accomplish this goal. A more specific goal would be “I want to lose 25 pounds by the Fourth of July.” This goal provides an exact amount of weight to lose and an end date to do it by. To learn more, read our blog post about SMART goals. When you write your goals down, they become real and tangible instead of a vague idea that resides only in your mind. Once you’ve written your goals down, keep them somewhere visible. This tactic reminds you to keep working on your goals daily.As you're writing down your goals, use a positive tone so you stay excited about completing them. Many people decide on a goal but never create an action plan to determine how exactly they will meet that goal. Your action plan should include the overall goal you’re trying to meet and all the steps you need to take to get there. Don’t be afraid to get creative with your action plan. Go back to your elementary days and write out your goal using crayons, markers, or colored pencils. According to Forbes, creating an action plan this way activates a different part of your brain and cements the goals in your mind. If this isn’t your style, you can use Lucidchart to help you create an organized, visual action plan. As part of your action plan, include a timeline for when you will start and finish your goal. Once you’ve set those dates, try to stick to them as closely as possible. A timeline creates a sense of urgency, which in turn motivates you to stay on schedule and finish your goal. Now that you’ve planned everything out, it’s time to take action. You didn’t go through all that work just to forget about your goal. Every step that you take will lead to another until you finish your goal. You need to keep your motivation strong to complete your goal. Consider scheduling a weekly evaluation, which could include measuring your progress and checking your schedule. Once you see how close the finish line is, you’ll feel more motivated to push through to the end. If you're a little behind schedule, make necessary adjustments and keep going. The process of setting goals makes you succeed faster and more efficiently. It can fuel your ambition and help you achieve tangible results. A goal setting process will help you determine how to set goals that are specific, timely, and realistic. As you begin the goal setting process, you’ll want to keep your thoughts organized. 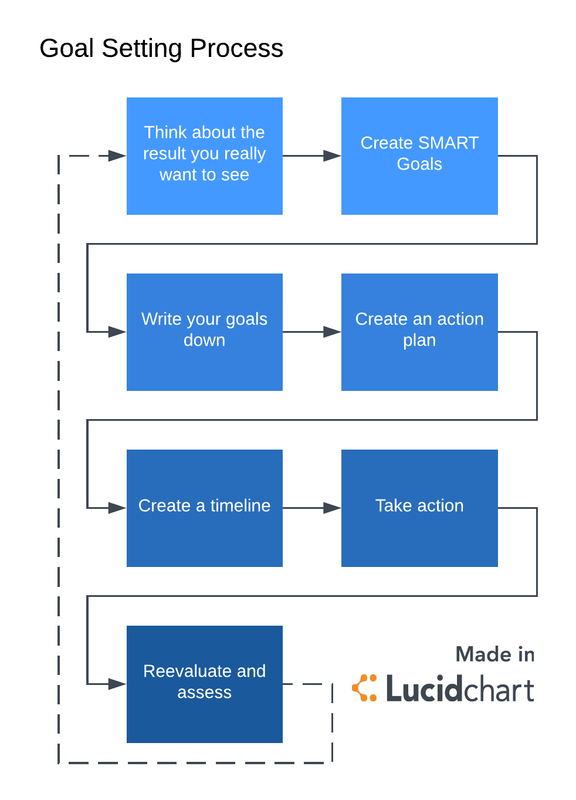 Capture all your goals, as well as your progress, in a visual format with Lucidchart.